The Olympics begin in less than two weeks, and you will spend a fortnight obsessing over athletes and sports you won't think about again for another four years. (If then.) To prepare you for the big games o' London, we're showcasing a different athlete every weekday until they begin. 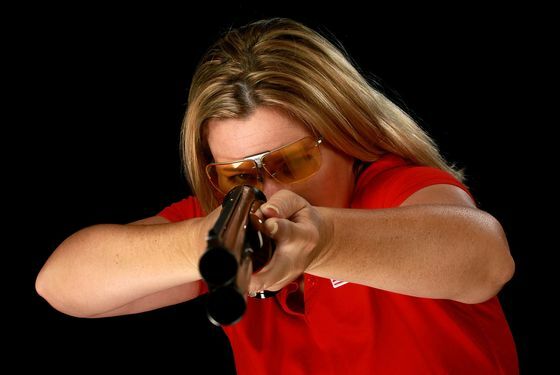 Today: Kim Rhode. Previous Olympic experience: Two golds, one silver, one bronze. The most amazing thing about this is that they're from four different Olympics. She won gold in Atlanta and Athens, silver in Beijing, and bronze in Sydney. This is her fifth Olympics. This is so old hat to her now. You might know her from: Do you watch the Outdoor Channel? If you do, you might have seen her as co-host of Step Outside. Also, if you're a subscriber to Shotgun Life magazine — and obviously you are — she has been on the cover several times. Though we think it's more awesome that she has her own iPhone shooter game. Most embarrassing public moment: This woman drives a pickup truck and could shoot us in the face with a shotgun from a football field away. We're not saying a thing. Most proud public moment: Winning a gold medal in the Atlanta games while still in high school, just days after her 17th birthday. What to expect from her this year: She's trying to become the first American woman to win an individual medal in five consecutive Olympics. It's worth watching for that. Odds that you'll remember her name in four years: Probably not, unless you really like that shooting game app. But we're gonna remember her name anyway, just in case. She has a gun, after all.